Google is always throwing around some cool deals on its products for those in the U.S., but this time, the UK user base is getting the treat. As at the time of this writing and all the way to December 31, 2017, those in the UK can purchase the Google Pixel 2 at a discounted price of £579. Usually, the Pixel 2 goes for £629 for the base model and £729 for the 128GB variant, however, with this offer, you can save a cool £50 on the same phone, but it’s get even better when it comes to the premium Pixel 2 XL. Rather than part with the usual price of £799, the current offer will see you save an even better £100, which means you pay £699 for the 64GB variant and an extra £100 for the 128GB variant. Either way, you get to save the same amount. Note that this offer is not only limited to time, but the search giant also says that it’s subject to availability of the phones. In short, you have to hurry and grab this deal right away. 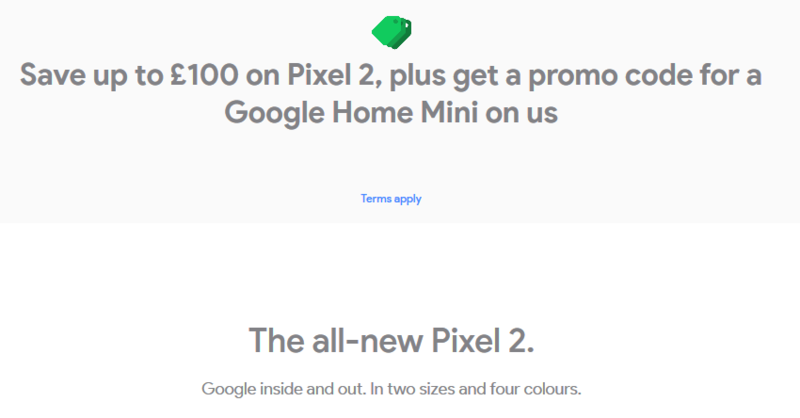 On top of saving up to £100 on the purchase of the Google Pixel 2 phones, Google is also offering a promo code for further savings on the Google Home Mini. As long as you order any of the Pixel 2 phones, you’ll be awarded a redemption code for the Home Mini. Once again, this is subject to availability and it’ll take 4-6 weeks before the promo is emailed to your account with respect to the delivery date of the Pixel 2 or Pixel 2 XL. When you receive the promo code, you can head to the official Google Store and redeem the Home Mini by adding it to your cart and at checkout, enter the promo code. The promo code is not transferable, cannot be exchanged for cash and is not reusable. Also, make sure this code is used before February 28, 2018, otherwise, it won’t work. Of course, this one is limited to UK residents who have or are willing to activate a Google Payments Account.